Housing • Company is credited with taking stands that cushioned market's collapse in state. 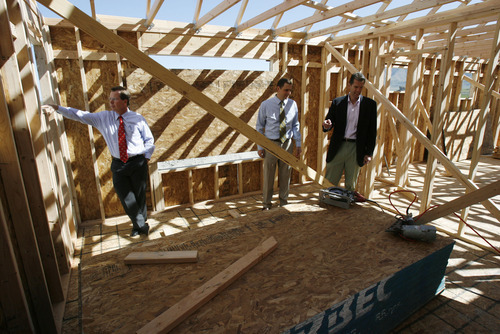 Francisco Kjolseth | The Salt Lake Tribune Clark Ivory, left, CEO of Ivory Homes, the biggest homebuilder in Utah, tours one of the many new homes being built in Stansbury Park along with CFO Rick Lifferth, center, and Jim Seaberg, president of Ivory Commercial. Ivory Homes has completed 15,000 houses over the years. It's been the top homebuilder in the state for at least 23 years and has been hugely influential in how homes in northern Utah look. Steve Griffin | The Salt Lake Tribune Tavnir and Hilary Carey and daughter Gretel, outside their new home in Daybreak in South Jordan, Utah Tuesday May 7, 2013. The family closed on their home at the end of March and by sheer coincidence, the sale happened to be the 15,000th home constructed by Ivory Homes. Steve Griffin | The Salt Lake Tribune Tavnir and Hilary Carey play, with their daughter Gretel, outside their new home in Daybreak in South Jordan, Utah Tuesday May 7, 2013. The family closed on their home at the end of March and by sheer coincidence, the sale happened to be the 15,000th home constructed by Ivory Homes. 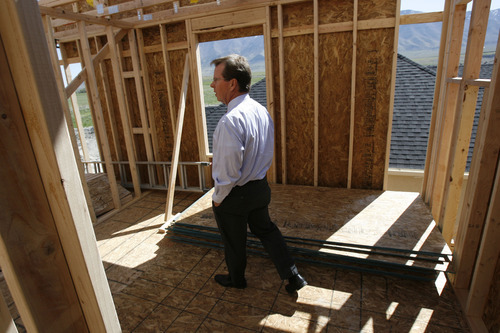 Francisco Kjolseth | The Salt Lake Tribune Clark Ivory, CEO of Ivory Homes, the biggest homebuilder in Utah, tours one of the many new homes being built in Stansbury Park. Ivory Homes has completed 15,000 houses over the years. It's been the top homebuilder in the state for at least 23 years and has been hugely influential in how homes in northern Utah look. Francisco Kjolseth | The Salt Lake Tribune Ivory Homes, the biggest homebuilder in Utah continues its development of Stansbury Park with new properties nearing completion. Ivory Homes has completed 15,000 houses over the years. It's been the top homebuilder in the state for at least 23 years and it has been hugely influential in how homes in northern Utah look. 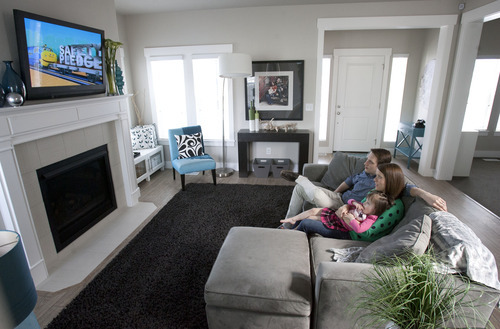 Steve Griffin | The Salt Lake Tribune Tavnir and Hilary Carey watch television with their daughter, Gretel, in their new home in Daybreak in South Jordan, Utah Tuesday May 7, 2013. The family closed on their home at the end of March and by sheer coincidence, the sale happened to be the 15,000th home constructed by Ivory Homes. 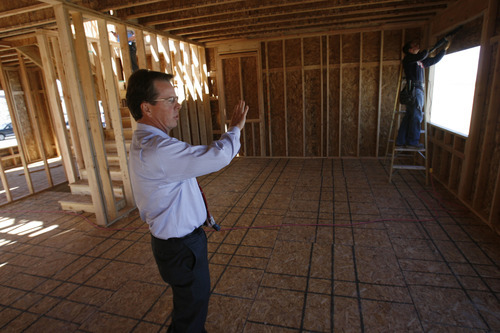 Francisco Kjolseth | The Salt Lake Tribune Clark Ivory, CEO of Ivory Homes, the biggest homebuilder in Utah, tours one of the many new homes being built in Stansbury Park. Ivory Homes has completed 15,000 houses over the years. It's been the top homebuilder in the state for at least 23 years and has been hugely influential in how homes in northern Utah look. Francisco Kjolseth | The Salt Lake Tribune Clark Ivory, second from left, CEO of Ivory Homes, the biggest homebuilder in Utah, overlooks plans on a new home being built in Stansbury Park along with Christopher Gamvroulas, president of Ivory development, CFO Rick Lifferth and Jim Seaberg, president of Ivory Commercial, from left. Ivory Homes has completed 15,000 houses over the years. It's been the top homebuilder in the state for at least 23 years and has been hugely influential in how homes in northern Utah look. 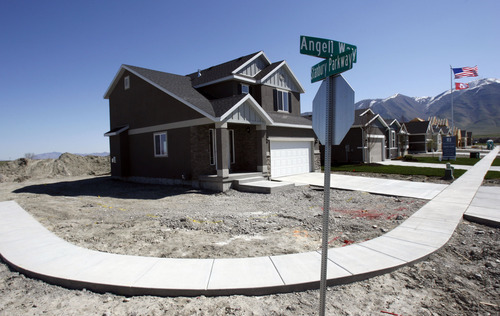 Francisco Kjolseth | The Salt Lake Tribune Ivory Homes, the biggest homebuilder in Utah continues its development of Stansbury Park with new properties nearing completion. Ivory Homes has completed 15,000 houses over the years. It's been the top homebuilder in the state for at least 23 years and it has been hugely influential in how homes in northern Utah look. 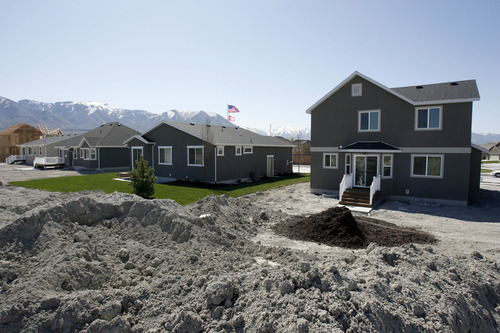 Francisco Kjolseth | The Salt Lake Tribune Ivory Homes, the biggest homebuilder in Utah continues its development of Stansbury Park with new properties nearing completion. Ivory Homes has completed 15,000 houses over the years. It's been the top homebuilder in the state for at least 23 years and it has been hugely influential in how homes in northern Utah look. Francisco Kjolseth | The Salt Lake Tribune Ivory Homes, the biggest homebuilder in Utah continues its development of Stansbury Park with new properties nearing completion. Ivory Homes has completed 15,000 houses over the years. It's been the top homebuilder in the state for at least 23 years and it has been hugely influential in how homes in northern Utah look. In 2005, when most builders were happily constructing homes and raking in revenue, Clark Ivory saw an unsustainable real estate bubble building along the Wasatch Front and in St. George. Ivory, CEO of a namesake company that has been Utah&apos;s biggest homebuilder for a quarter-century, was so concerned that he drafted an internal memo outlining which builders would fail when the market cooled. Without naming names, he singled out those who behaved as if there was no end to the white-hot market, carried excessive debt, or paid too much for lots and undeveloped land  betting that prices for new homes would continue rising and consumer demand wouldn&apos;t falter. That year, Ivory took another step that he hoped would slow what he saw as rampant speculation in the housing market. Because Ivory Homes wanted to keep speculators out of its communities, Ivory buyers had to sign binding agreements to live in their homes and not sell them for a year. Violators would be subject to forfeiting the first $25,000 of any gain. He took his message to the public, too, and found at least one other company willing to make the same requirement of its buyers. In 2006, Daybreak developer Kennecott Land put an identical proviso in its sales contracts. It&apos;s still in effect. "We came out at that period of time and said this market is overheated because of the number of speculators," Ivory said, recently, recalling what he told other builders the time. "There are too many people buying houses that have no interest in living in them. As a result, we are going to end up with an oversupply, and when we have an oversupply, there is going to be a sharp correction in price." By some accounts, Ivory&apos;s action saved not only his company when the bubble eventually burst in 2007 and drove more than 160 Utah builders out of business, it cushioned the collapse of home prices and helped set the stage for the state&apos;s recovery from the Great Recession. Although Wasatch Front and St. George home prices escalated, they never got as high as they did in Phoenix or Las Vegas, said Kelly Matthews, Wells Fargo&apos;s chief economist in Utah until he retired in 2009. "What he did slowed the pace of price increases, and hence we didn&apos;t dig ourselves as deep a hole, and were then able to come back faster than those other two areas, and now find ourselves in an overall position with the best economy in the United States," Matthews said. "I think the bust was not as severe for Clark as it was for others," said James Wood, director of the University of Utah&apos;s Bureau of Economic and Business Research. 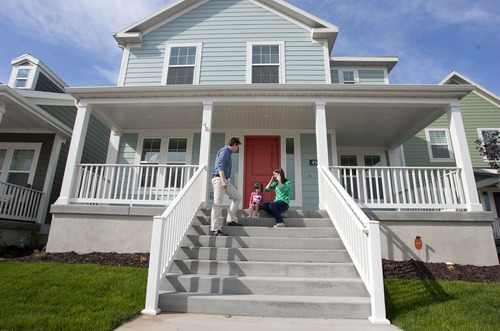 "Single-family home-building dropped 80 percent. You can&apos;t say it wasn&apos;t a depression. For Clark, I think he foresaw the bubble and he escaped that 80 percent decline in activity." 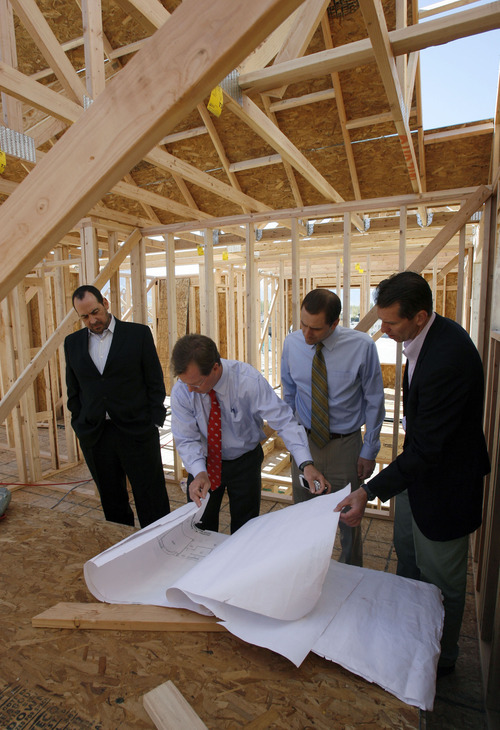 Building trust • Ivory Homes has been the top homebuilder in Utah since at least 1991, according to Construction Monitor, a building industry data aggregator. (Clark Ivory believes his company reached No. 1 three years earlier.) Since 1983, the Murray-based company has built 15,000 homes, with an average price over the years of $200,000 (its average this year is $324,000). Over the past 30 years, the total value of all those homes comes to about $3 billion. "We really like it," said Tavnir Carey, who with wife Hillary bought Ivory&apos;s 15,000th house at the end of March. The couple bought the two-story-with-basement colonial in Daybreak for $300,000. The Careys are first-time homeowners. Married in 2005, they had been living in a rented town home with their two daughters, ages 3 and 1. With 3,000 square feet, their new house has twice as much space, Tavnir Carey said. "We looked around a lot and we just fell in love with the floor plan. It met all our needs. We could just find practical uses for every room. How it was set up seemed to work with our lifestyle," he said, and added, Ivory Homes "was a brand we could trust." The company has an A+ rating at the Utah Better Business Bureau and has received just three citations from the state Division of Occupational and Professional Licensing, the last in 2004. The company is not just the biggest builder in Utah. It is enormously influential, admirers and rivals say. Matthews, who confessed he didn&apos;t see the housing bubble forming as soon as Ivory did, said because of its size only Ivory Homes could have persuaded other builders to withhold their homes from speculators. Richmond American Homes, the No. 2 builder in Utah at the time, reportedly made buyers sign similar contracts, too (the Denver-based builder didn&apos;t respond to a request for comment). "What&apos;s the difference between Las Vegas, St. George and Salt Lake? I think it was Clark Ivory&apos;s decision to avoid allowing people to flip his homes," Matthews said. The company didn&apos;t stop there. Rene Oehlerking, marketing director for rival Garbett Homes in Salt Lake City, said Ivory Homes was a "political powerhouse" that lobbied the Utah Legislature on behalf of the building industry during the height of the recession. 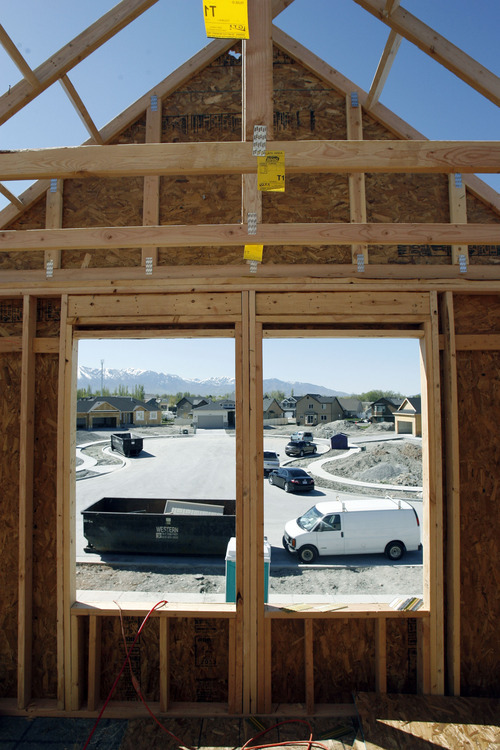 The company championed a state grant program designed to entice Utahns to buy new homes and help struggling builders. 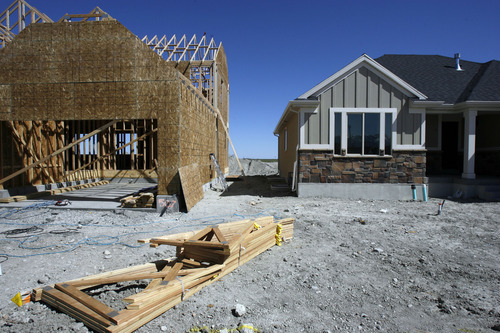 The program made grants to 1,655 buyers totaling $16.9 million between March 2009 and January 2010, according to the Utah Housing Corp.
"It worked miracles," Oehlerking said. Battling back • Ivory Homes has a history of devising solutions to keep itself going in trying times. Before it became a homebuilder 30 years ago, the company&apos;s main business was developing lots. When mortgage interest rates reached as high as 18 percent and 19 percent in the early 1980s, Ivory Homes found itself with numerous unsold lots, as well as an uncomfortable amount of bank debt. One of the ways out of its predicament was to construct homes and sell them directly to consumers. Clark Ivory isn&apos;t reserved about his effort to stabilize the construction market eight years ago. But he adds that he acted mainly out of self-interest. He believed many of his rivals were behaving recklessly by selling homes to investors who would probably dump hundreds of properties back onto the market when it collapsed. A glut of investor-owned homes suddenly for sale while the market was tanking would drive down prices and hurt everyone, including Ivory Homes. "While we didn&apos;t completely prevent the [collapse] from happening, we tempered it. We kept there from being too much investor activity," Ivory said. "The fact that we wouldn&apos;t [sell to speculators] as the biggest player in the market, and we tried to get as many other [builders] as possible to go along, it helped us. "In fact, in 2007, when most of our building competitors were reeling because they were having to compete against homes that were for sale in their own subdivisions, we didn&apos;t have that. In the end, what happened was we had a fantastic year." The company brought in $470 million in revenue, a record it has never equaled. It closed sales on 1,126 homes, down from a record 1,202 homes in 2006 but still its second-best year ever. There was another benefit. Ivory Homes used the record revenue to pay down its credit lines, and by 2009, when the housing market was still falling, the company was free of debt. Instead of paying back banks, the company could now buy land at depressed prices, using its own cash instead of financing the purchases with loans. Today, it controls more than 5,000 building lots. Some are optioned, but most are owned outright. Ivory Homes also controls enough ground for 3,000 apartments. "They&apos;ve been very consistent in their land acquisition and their development strategy," Garbett Homes&apos; Oehlerking said. "Their consistency is incredible, and a tip of the hat to them." 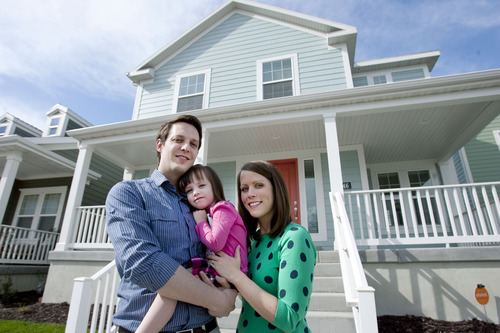 Ahead of the game • For many builders, the housing downturn appeared to ease in 2010. That year, Ivory Homes notched a small rise in sales  just 29 more than in 2009, when it closed on 456 houses, its weakest performance since 1993. But the upward trend accelerated in 2011 and gained speed in 2012. This year, the company expects its sales to reach 700 homes  still far off the pace set in 2006, but 24 percent more than last year. If that happens, 2013 will be Ivory Homes&apos; best year since 2005. To generate buyers during the recession, Ivory Homes hit on two tactics. To help people with good credit scores who worried about losing money if they sold their current homes in the depressed housing market, the company hired Smart Move Advantage. If a would-be buyer leased their existing house to a tenant, Kaysville-based Smart Move would guarantee the lease payments for up to three years. The company would manage the property and take care of any home repairs, freeing the owner to buy an Ivory home. Last year, 99 buyers moved into homes with the help of Smart Move. Ivory Homes also rolled out a program to help people with low credit scores. Counselors worked with would-be buyers to clean up their credit reports, improve their scores and restructure their debts. In 2012, 75 buyers qualified for loans because of the program, Ivory said. "Had we not done that, they wouldn&apos;t have been able to buy a home. Some of them, it took us three months to get them into better shape, others it took two years," he said. "And now, we are continually graduating people through the Ivory Financial Fitness Program with better credit, and that&apos;s allowing us to sell to those people." Ivory Homes has sold 5,000 houses since 2006  the year before the recession&apos;s official start in December 2007. Fully one-third of all the homes the company has ever built were sold since then. There is no doubt that the company turned the worst economic downturn in Utah since the 1930s to its advantage. Ivory said the question that confronted the company was how would it beat the crisis. "My dad [Ellis Ivory, who retired in 1999] and I have often had the debate, what&apos;s been the toughest downturn? The early 1980s when he was forced to become a builder to get rid of his inventory [of unsold lots]? "That&apos;s when we became a builder in the first place. It was out of necessity. Sometimes difficulty and challenges breed new opportunities. The same thing happened in the 2007-2008 period, as we went through a tough time." The company has sold 15,000 homes worth about $3 billion since 1983. A look at the past decade.